WT title is "'Homegirl in a Hijab' Returns: Linda Sarsour, an activist venerated by the left, does more damage." To see the paper version, click on the PDF above. 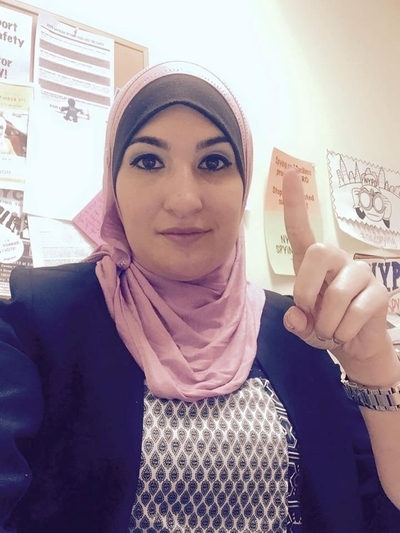 What to make of Linda Sarsour of Brooklyn, lead plaintiff in the lawsuit against President Trump's immigration order and the new, seemingly ubiquitous symbol of the hard Left-radical Islam alliance? The Obama White House designated her a "champion of change." New York City Mayor Bill de Blasio sought her endorsement. Vermont's Senator Bernie Sanders used her as a surrogate in his presidential campaign. She served as a delegate to the 2016 Democratic National Convention. 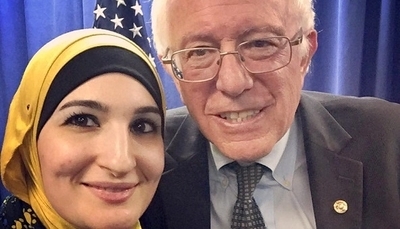 Linda Sarsour with Bernie Sanders. She appeared on major television shows and the New York Times ran a long puff piece calling her "a Brooklyn homegirl in a hijab." David Brock's Media Matters for America advocates for her. She was one of four lead organizers of the anti-Trump Women's March on Washington. Actress Susan Sarandon and Rep. Keith Ellison endorse her. Sarsour, in brief, is "venerated by leftists," observes Muslim reformer Shireen Qudosi. And Islamists too: for example, Al-Jazeera celebrates her. Sarsour plopped herself into my life in March 2010 when she confused me, Daniel Pipes, with PipeLineNews.org, a "boutique news service" that had run a critical article on her calling her a "Hamas sympathizer." She responded by showering me with mock gratitude for the attention ("THANK YOU Mr. Pipes!"). Noting her error, I wrote a sarcastic response ("Sarsour ought to shower PipeLineNews.org, not me, with her affections"). When she did not acknowledge her mistake, I took an interest in her career. 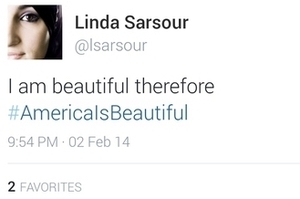 I learned that Sarsour frequently errs without later correcting herself. She wrongly portrayed the murder of Shaima Alawadi as resulting from hatred of Muslims when in fact Alawadi's Muslim husband, Kassim Alhimidi, honor-killed her. Worse, she faked a hate crime against herself, scoring political points nationally by portraying a mentally ill homeless man as a violent racist. I learned about Sarsour's paranoid loathing for the U.S. government. She portrayed would-be underwear bomber Umar Farouk Abdulmutallab as a CIA agent, implying that the federal government murders Americans to frame Muslims. She also off-handedly claimed Muslim "kids [are] being executed" in the United States, presumably by the government. I learned about Sarsour's promotion of Islamism. She endorsed Saudi Arabia because the application of Islamic law there brings such alleged benefits as paid maternity leave and no interest payments on credit cards. She signaled support for jihad warfare by making the pointed index finger gesture, its symbol. I learned about Sarsour's vicious attacks on Israel. She encouraged stoning the Israel Defense Forces. She posed for a photograph with Salah Sarsour, a Hamas operative jailed by the Israeli authorities in the 1990s. She acknowledges having many male relatives in Israeli prisons. I learned about Sarsour's ignorance of history. She promotes a fantasy notion of Islam's founder, Muhammad: "Our prophet was a racial justice activist, a human rights activist, a feminist in his own right. He was a man that cared about the environment. He cared about animal rights. ... He was also the first victim of Islamophobia." Her musings on American slavery caught my eye: "The sacrifice [that] the black Muslim slaves went through in this country is nothing compared to Islamaphobia [sic] today." I learned about Sarsour's low reputation among her should-be allies. Debbie Almontaser, an Islamist colleague, disparaged her immodesty and lack of humility. Feminist Aki Muthali called her a racist (read again that quote about black slaves). The anti-Zionist Ikhras website also accused her of harboring "an ugly racism towards African-Americans." Additionally, it characterized Sarsour's public persona as "a masquerade inundated with pretense and exaggeration"; it portrayed her as fake religious; and it found her lacking a moral compass or having "genuine convictions or principles." I learned how Sarsour answered critics with vitriolic vulgarity. Typical of her charm and grace, she said of Brigitte Gabriel and Ayaan Hirsi Ali, two leading anti-Islamists (and the latter a victim of female genital mutilation), "I wish I could take their vaginas away – they don't deserve to be women." I learned that Sarsour, a plain, ill-dressed woman in a lumbering hijab, indulges in coquettish vanity. She publicly boasts of her "striking good looks," announces "I am beautiful," and raves about "Such a beautiful photo taken of me." Sarsour also clumsily self-inflates, for example, by referring to herself as one of the "amazing people." This long record of incompetence, extremism, vulgarity, and eccentricity makes me wonder how Islamists and Leftists jointly swoon, as they do, over Linda Sarsour. If she's their vaunted star, conservatives can rest easy. Mr. Pipes (@DanielPipes) is president of the Middle East Forum. © 2017 by Daniel Pipes. All rights reserved. Feb. 3, 2017 addendum: I discuss the fluid headlines of this analysis at "An Author's Lament over Article Titles."